USS Raleigh CL-7 anchored in San Diego Harbor 21 October 1933. 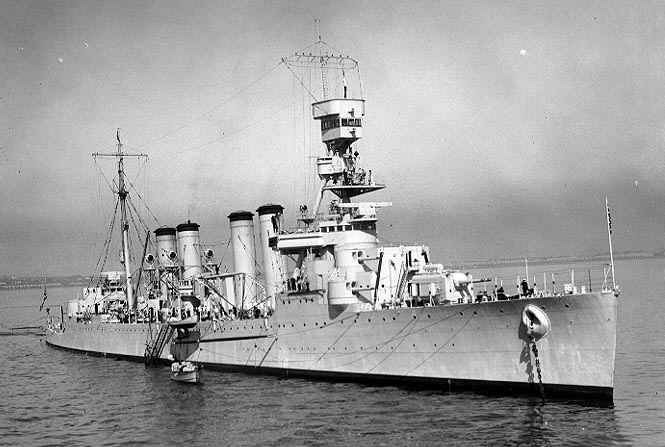 Note that the 6" (15.2 cm) guns were in both twin turrets and single casemate mounts. U.S. Naval Historical Center Photograph # NH 64621. 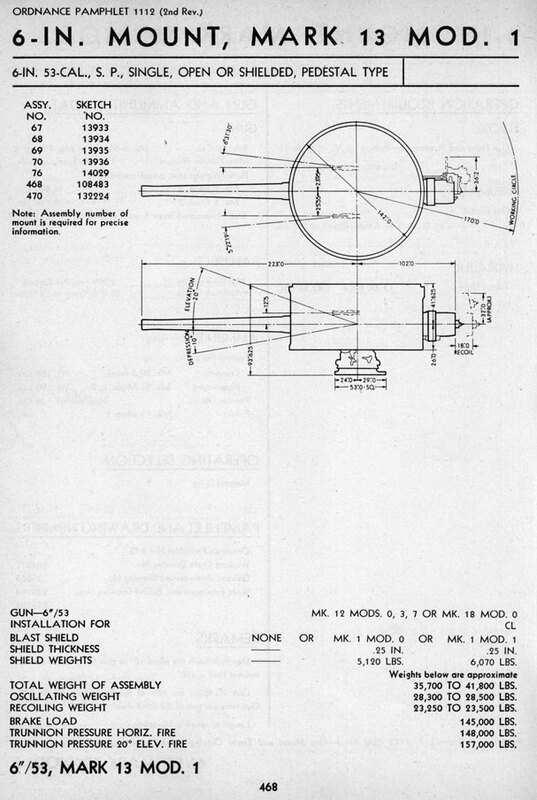 An improved weapon used on the Omaha (CL-4) class Light Cruisers and in a wet mount on the "Submarine Cruisers" of the Argonaut (SS-166) and Narwhal (SS-167) classes. They were also planned for the never-built South Dakota (BB-49) class battleships and Lexington (CC-1) class battle-cruisers. During initial gunnery trials for USS Trenton (CL-11) on 20 October 1924, two charges of powder in the forward twin mounting were ignited. Twenty men were in the twin mount of whom four died almost immediately and ten died later from burns and inhalation of flames and gases. The remaining six were severely injured. Ensign Henry Drexler and Boatswain's Mate First Class George Cholister were posthumously awarded the US Congressional Medal of Honor for their attempts to prevent the tragedy. Mark 12 was of built-up construction consisting of A tube, liner, full length jacket, two hoops, one locking ring and a screw box liner. The Welin breech was a side-swing model with Smith-Asbury mechanism. The Mark 14 was of autofretted monobloc construction. Mark 15 was to have been a lighter-weight monobloc but was not built. Mark 18 was a relined Mark 12 with chrome plating. ^Special Common had a windscreen and a thin cap and the body was strengthened to enhance its armor piercing qualities. Common Mark 32 had a windshield but no cap. 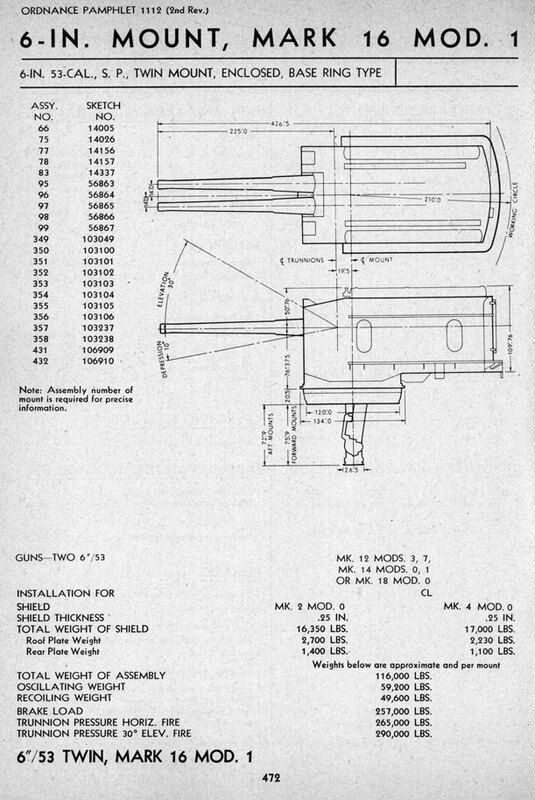 ^2.12.2AP rounds do not appear to have been issued during World War II, SP Common was issued in its place. ^3.13.23.3AP, SP Common and HC projectiles were carried by cruisers. ^Common Mark 24 rounds were carried only by submarines. ^The effect of HC rounds on barrel life was equivalent to only 0.16 of the AP round while the training round, which had a muzzle velocity of 2,300 fps (701 mps), was 0.13. ^Cincinnati (CL-6), Raleigh (CL-7), Detroit (CL-8), Richmond (CL-9) and Marblehead (CL-12) had the after lower casemate guns removed during the 1930s as weight compensation for growth in other areas. 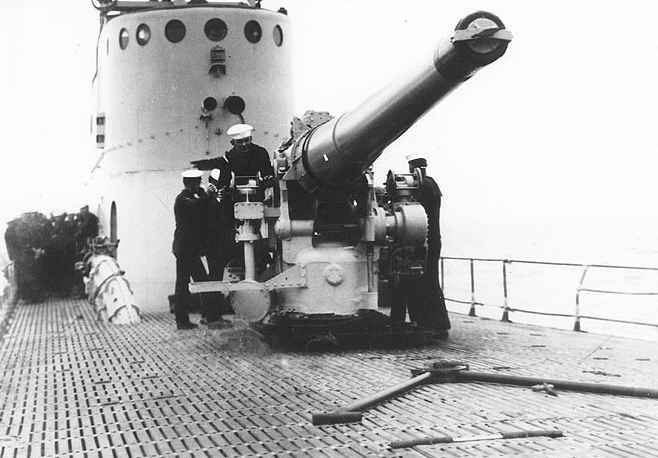 Marblehead had one of these guns remounted on the centerline in a superfiring position on the after superstructure. During World War II, the remaining cruisers were reduced to 10 guns by removal of the two after casemate guns and Marblehead lost her centerline gun. 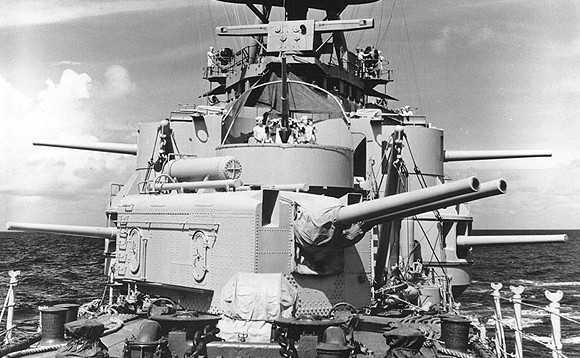 In 1945 Detroit was reduced to eight guns by the removal of her two forward upper casemate guns which were replaced by twin 40 mm mountings. 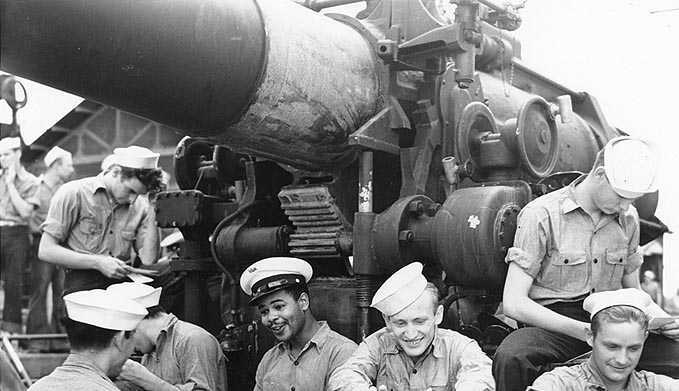 Aft guns on USS Memphis CL-13 about 1941-42. The cylinders atop the mount supply water and compressed air. Note the 3"/50 (7.62 cm) AA gun directly behind the turret. Detail from U.S. Naval Historical Center Photograph # 80-G-10535. Two of the casemate guns on USS Omaha CL-4. Picture taken in August 1933 after overhaul at the Puget Sound Navy Yard. Note the rangefinder and the Battle Efficiency "E". Detail from U.S. Naval Historical Center Photograph # 93507. 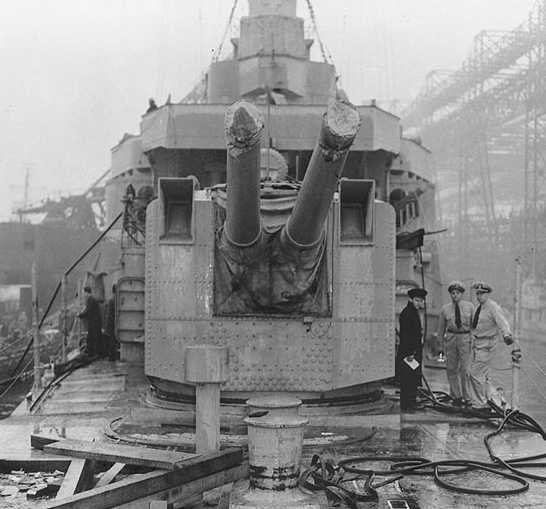 After twin mounting on USS Marblehead CL-12 during repairs at New York Navy Yard in 1942. U.S. Naval Historical Center Photograph # 80-G-254938. USS Narwhal SS-167 in 1943. 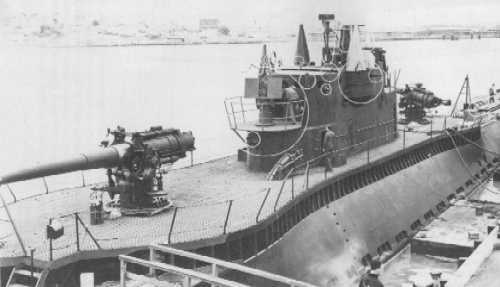 One of the "submarine cruisers" with two 6"/53 (15.2 cm) guns. Note the open breech on the aft gun. USS V-4 (later Argonaut SS-166, later APS-1) in June 1928. Note the ammunition scuttle at left and the bipod barrel support in the foreground. Detail from U.S. Naval Historical Center Photograph # 69206. 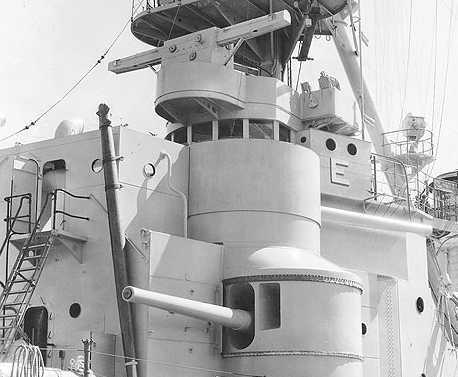 6"/53 (15.2 cm) gun on USS Argonaut APS-1 in August 1942. Note the pinion and arc elevation gear. Detail from U.S. Naval Historical Center Photograph # 80-G-11741. 6"/53 (15.2 cm) casemate mounting for Omaha (CL-4) class Light Cruisers. Sketch from OP-1112. Image courtesy of HNSA. 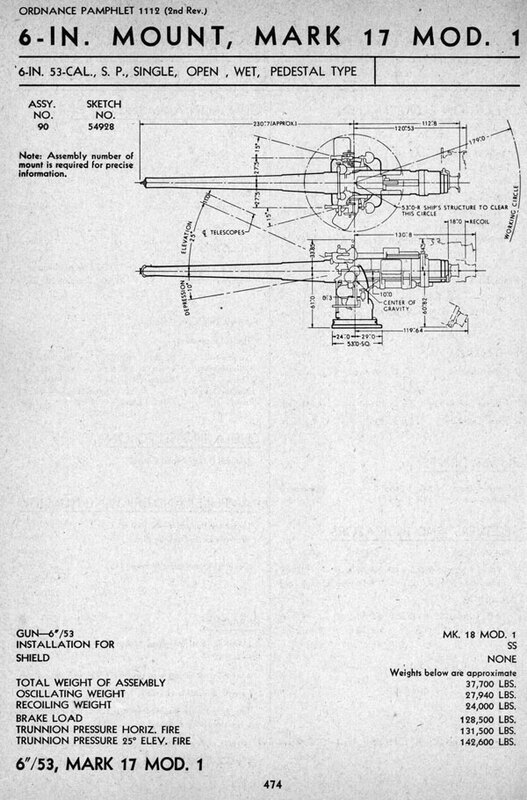 6"/53 (15.2 cm) Twin Mounting for Omaha (CL-4) class Light Cruisers. Sketch from OP-1112. Image courtesy of HNSA. 6"/53 (15.2 cm) wet mounting for submarines. Sketch from OP-1112. Image courtesy of HNSA. Cutaway view of SP Common Mark 27.